During 2018, Gilat helped the world move closer toward closing the digital divide by providing solutions that enable abundant broadband connectivity to unserved and underserved areas on the land, sea and air. Early in the year, Gilat was selected to deliver the satellite platform for Australia’s National Broadband Network, NBN Co. Gilat’s X-Architecture platform is now being integrated into NBN’s ten satellite gateway infrastructure, allowing NBN to address Australia’s broadband demand for businesses and government customers. During 2018, Gilat signed a partnership agreement with Russian satellite operator Gazprom Space Systems (GSS) to provide broadband coverage over a new Ka-band satellite, Yamal 601. This satellite will be launched in 2019 and is planned to serve the European and Asian regions of Russia. Already having a longstanding partnership with Eutelsat, Gilat has become the dominant player in the Russian Ka-band satellite broadband market. Similarly, in China, Gilat became the sole provider of the ground network for HTS Ka-band capacity across the entire country. Gilat’s network will operate with the soon to be launched ChinaSat-18 (CS-18) and the existing CS-16 satellites. The deployments with Gazprom, Eutelsat and China Satcom create a unique ground network that stretches from Asia to Europe and enables continuous Ka-band coverage. This “Space Silk Road” covers two billion people, 23 million square kilometers and 30 countries. Gilat further strengthened its leadership position with additional collaborations worldwide. In Latin America, Gilat partnered with Hispasat to provide the ground segment for the Amazonas 3 and Amazonas 5 satellites over Mexico and Brazil. In Japan, Gilat partnered with SKY Perfect JSAT, Asia’s largest satellite operator, to support its solutions for Mobility and Fixed broadband services. Gilat’s single platform for multiple applications is the basis for expanding its offering worldwide from enterprise and consumer broadband services to applications such as In-Flight Connectivity (IFC) and cellular backhaul. For example, Gilat is seeing further development of IFC in China and Russia. At the start of 2018, a live demonstration of Gilat’s Ku-/Ka dual-band aero terminal, AeroEdge 6000, took place at a customer’s site in China. The terminal demonstrated unprecedented speeds of more than 130 Mbps while maintaining application continuity with automatic beam/gateway and satellite switchover. This terminal is the only dual-band complete aero terminal that can operate and provide service over any satellite and any network, as well as having the flexibility to interwork with other modems, antennas and power amplifiers. This distinct advantage accommodates the diverse requirements of airlines and service providers. The year ended with the achievement of a major milestone with promising business opportunities worldwide. Gilat’s AeroEdge 6000 passed the standard for environmental testing of avionics hardware, receiving the DO-160 certification and qualifying for installation on commercial aircrafts. As the quest for data communication over mobile devices continues to grow, Gilat is seeing a major expansion of satellite-backhauled LTE sites, as well as ongoing growth of the capacity required for current sites. A wide variety of use cases are being deployed, such as coverage for islands, metro-edge and tourists visiting national parks and mountainous areas, as well as using satellite-based CBH to support disaster recovery. The growing number of Gilat customers and sites indicates that the industry is overcoming the myths that were associated with cellular backhauling over satellite and is embracing satellite backhaul as a mainstream solution. Today satellite backhauling is being used to complement terrestrial solutions with an uncompromised user experience, competitive bandwidth costs and significant reduction of complexity. Gilat was selected for major new projects this year by KDDI Corporation in Japan and by Telstra in Australia. Global deployments also included reduced complexity with Layer-2 and Layer-3 integration of the satellite backhaul with the terrestrial network. All of the projects mentioned above take advantage of Gilat’s multi-application, multi-beam, and multi-satellite X-Architecture that is optimized for HTS. The underlying multi-service SkyEdge II-c platform supports applications such as: enterprise, cellular backhaul and mobility services over a single platform. The platform delivers high spectral efficiency and optimized space segment via advanced DVB-S2X waveform and Gilat’s innovative LDPC-based fast adaptive return access scheme. 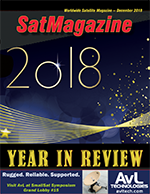 In addition to its ongoing business, Gilat is heavily engaged in the next wave of satellite constellations — i.e., Non-Geostationary Orbit (NGSO) — and this will continue to be a major focus in 2019. One of the high points in this area during 2018 was Gilat’s collaboration with Global Eagle and Telesat in the first-ever live in-flight broadband testing with an LEO satellite. 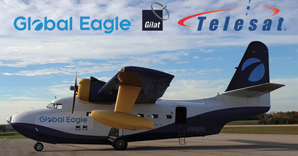 The testing, carried out on Global Eagle’s Albatross test aircraft, has yielded continuous uninterrupted broadband connectivity, while also performing switchovers between Telesat’s GEO and LEO satellites. Multiple broadband services were demonstrated and tested, including secure real-time video chat using Skype and Whatsapp in parallel, as well as secure Internet browsing. This milestone underscored the technological advantages of Gilat’s solution, which supports multiple applications, satellites, bands and beams and is also the first in the industry to demonstrate multi-orbit connectivity. Satellite communications is an integral enabler of the 5G connectivity vision and has an inherit advantage when facilitating ubiquitous connectivity while driving network efficiencies forward. Gilat is active in the SaT5G European project which aims to introduce satellite communication-related standards into future releases of 5G standards. As a leading global provider of 4G satellite backhaul services, Gilat sees the transition to 5G service enablement as a natural evolution of its current service offering, centered on its cloud-based X-Architecture. Gilat is working closely with customers and partners to enable effective extension of 5G service and use cases, as well as developing next generation high performance terminals. Leveraging its SkyEdge II-c platform, Gilat is developing efficient interfaces to 5G network functions and implementation of full network orchestration, network slicing, service slicing, QoS, acceleration and security. With the growing importance of mobility applications and the emergence of NGSO constellations, Electronically Steered Array (ESA) antennas are another key focus area for Gilat. Major progress is being made on Gilat’s joint development with Airbus of an ESA antenna for in-flight connectivity, as part of the European Commission’s Horizon 2020 program. This Ka-band ESA terminal is based on Gilat’s chipset for its Phased Array Antenna (PAA). Gilat is investing in ESA antennas for the aero market to address the expected efficiency challenges of the upcoming market transformations. The characteristics of ESA antennas such as flat panel, instantaneous bandwidth, beam agility, multi-beam connectivity, scalability/modularity and longevity — are imperative for unlocking new business opportunities and for maximizing performance of satellite networks. In 2019, Gilat expects to continue to demonstrate technological innovation in key industry segments for the benefit of its extensive customer base worldwide. Moving forward, Gilat is committed to the ongoing development of cutting-edge technologies and products that improve the quality of lives through enhanced broadband connectivity all the time and everywhere. Doreet Oren (doreeto@gilat.com) is Director of Product Marketing & Corporate Communications for Gilat Satellite Networks. Doreet Oren has been in this role since 2012 and has been responsible for defining product positioning, messaging, go-to-market strategies, market research, and analyst relations. Oren has more than 20 years of industry experience, and has held management positions in R&D, product management and product marketing, for international high-tech companies. In this capacity she contributed to next generation product definition and was responsible for delivering the company’s vision to the media and analyst community. Oren has published thought leadership articles in renowned international journals, and has spoken at numerous industry conferences worldwide. 2018 was a year of ‘fire and fury’ for new Australian rocket company, Gilmour Space Technologies, which is targeting to launch a range of low-cost, hybrid rockets for the global small satellite market starting in 2020. “We started the year with a 45-kilonewton hybrid engine test fire in January, scaled it up to a record 80 kN in August and are now two months from a suborbital flight test of this orbital-class rocket engine,” said the company’s CEO and Founder, Adam Gilmour. This will be the company’s second launch since a successful sounding rocket test in mid-2016 (see the image at the bottom of this page). 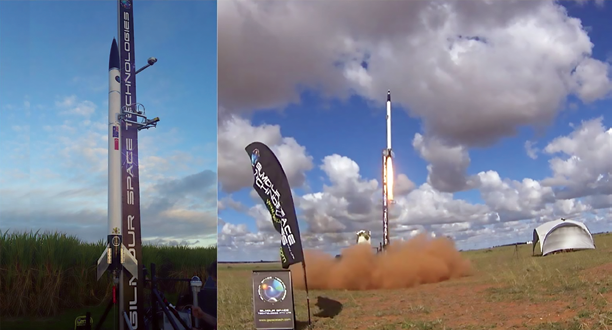 Despite being half a world away from most of today’s space launch activities, this small company based in Queensland, Australia, has joined the race to provide smaller and less expensive launch vehicles for the next generation of smallsats heading into Low Earth Orbits (LEO). Gilmour Space plans to launch Eris-100 in 2020, a three-stage commercial vehicle capable of carrying 100 kg. into LEO, to be followed by Eris-400 in 2021, a clustered-engine vehicle for payloads up to 400 kg. To address this global bottleneck, Gilmour Space is working to deliver dedicated and ride-share launches for smallsats weighing up to 400 kg., at prices that will enable more business and growth in this exciting new market. In September, the company secured A$19 million (US$13.5 million) in a second round of funding from Australian and international investors, including Blackbird Ventures, Main Sequence Ventures and 500 Startups, bringing their total investment to date to A$26 million. In 2018, Gilmour Space signed a Space Act Agreement with NASA to collaborate on potential space research and technology development initiatives; two space veterans were appointed to the firm’s board of advisors — former NASA deputy administrator, Professor Dava Newman, and former NASA astronaut and shuttle commander, Colonel (Retired) Pamela Melroy. To support their launch efforts, the company also began work on a mobile launch platform for their rockets this year. Looking forward into 2019, Mr. Gilmour believes that the New Space industry will need to see more small launchers coming online from 2019, as well as higher cadences from existing launch companies. “More rockets means more business, and that will drive the small sat market to new heights,“ he noted. “I’m also encouraged to see continual venture capital investments into the New Space industry for both launch vehicles and satellite services. We think 2019 will be a year in which space agencies (including those in the U.S., Europe and Japan) will start to ramp up their efforts to work with small private space companies. There will likely be a record number of payloads heading to the moon surface in 2019, which would be a great sign of things to come. “Australia, too, is seeing the dawn of a New Space Age, with a newly established space agency and key amendments in legislation that will enable domestic launches,” the company’s CEO noted. “Ultimately, however, what customers want are reliable, timely and affordable launches that get their payloads to where they need them to be. There are a lot of eyes on us at the moment, but that’s fine... because we plan to deliver,” Mr. Gilmour concluded. Bookings for launch will open in 2019. Adam Gilmour is the CEO and Founder of Gilmour Space Technologies, a venture-funded, hybrid, propulsion company that is pioneering low-cost rocket development and launch for small satellites up to 400 kg. Considered one of the leading space startups in Australia, Gilmour Space is scaling up to launch its first commercial hybrid rocket to LEO in 2020. My first day of work out of college as a systems engineer is easy to remember. It was 8-8-88: August 8, 1988 — much has changed since that date; however, one element has been constant — Innovation. Globecomm started life as a systems integration company building satellite Earth stations. Today the firm integrates complete satellite networks and provides sophisticated terminals to high-demand users in the commercial and commercial markets. However, that is just the tip of the iceberg. The company also develops and operates data and media centers, cellular and maritime networks, software platforms, global fiber-satellite networks, and much more. Technology innovation across multiple markets has become Globecomm’s business, and the end of the year provides a chance to assess where those technologies have, and will, take us in the future. Mobility is the great growth driver for wireless telecom — and wireless most definitely includes satellite. The maritime market has been slow to accept what the rest of the business world knows: expectations for connectivity everywhere are high and online services can substantially boost productivity and improve performance. During the past year or two, that has begun to change in a big way. Reflecting that is a growing preference for higher-capacity VSAT over L-band for maritime networks. Once costly and complex to install and operate, VSAT has become simpler, more automated, more affordable and flexible. Cost-sensitive ship owners are taking note, and Globecomm is helping them find the correct solutions for their needs. The next generation of mobility promises a drastic multiplication of growth in capacity demand. The upcoming rollout of 5G and IoT will provide individual 5G and IoT devices on the network with between 1 and 10 Gbps of speed with practically unlimited capacity. That translates into a requirement for backhaul that is 100 times greater than today, particularly as the rise of IoT applications adds to total demand. Compared with previous generations, 5G service will depend on a much greater density of cell sites to support the high-bandwidth, low-latency service required by the 5G specification. Since the firm’s inception, Globecomm has provided cellular backhaul solutions and managed services by delivering SCPC and TDMA VSAT solutions in developing countries, where fiber and microwave are either impractical or too costly. In the U.S., we’ve provided cellular backhaul for GSM, UMTS and LTE networks for years and — unique among teleport operator — the company owns and operates Tier-1 cellular switches. That technology allows us to provide hosted switching for rural operators, who act as roaming partners for the large MNOs but also want to provide cellular services to their general population. Satellite has the capability to support the rollout of 5G meeting the fronthaul and backhaul capacity demands of 5G and IoT growth. Furthermore, using techniques such as data offload and optimization, satellite offers a cost-effective solution to increase the effective capacity of lower-generation cellular networks. The same holds true for video. It is estimated that more than three-fourths of the world’s mobile data traffic will be video by 2021. Globecomm is already involved in the content delivery business for broadcasting, OTT and IPTV, and we expect that experience to be valuable in video delivery across 5G. As each viewer requires a separate stream in an internet environment, we are talking about billions of individual streams, especially for high-demand programming. The most cost-efficient way to provide that is by using satellite to deliver content close to the edge, leveraging the one-to-many competitive advantage of the technology. For any of this to be achieved, satellite must aggressively engage with the standards’ committees to have a voice in the development of specifications. Recently, we’ve seen the C-Band Alliance (CBA) announcement that the organization is talking with the FCC regarding proposals to use satellite’s C-band frequencies to help boost take-up and deployment of 5G cellular. However, the satellite industry also needs to take an approach to ensure multi-technology connectivity — inclusive of satellite — is considered to truly provide continuity of connection. The new LEO satellite constellations promise low-latency broadband connectivity with global coverage, narrowband connectivity with partial coverage or some variation of the two. However, one thing they all promise is a much greater amount of satellite bandwidth with lower price points, depending on how many of the 40-odd applications actually make it through the licensing process. One thing is certain: the success of the non-GEO constellation will depend on development of low-cost, electronically-scanned flat panel antennas. The past year has seen an acceleration of manufacturing advances, commercial pilots and strategic partnerships, and more are certainly on the way. Growth in both the antenna and LEO services markets requires antennas that can get to market quickly, are continuously interoperable among satellite configurations and frequencies, and come in a single, easy-to-install unit at a successful price point. The challenge is huge, but so is the opportunity. Of all the trends of the past year, the most interesting is the battle to manage the increasing complexity of applications and the networks they run on. More and more, we’re noting the need for instantaneous, automated decision-making, supported by network resources — whether for autonomous vehicles, security applications, entertainment or e-commerce. This screams for computing at the edge, which in turn demands a mix of transmission technologies, of which satellite will always be one. The success of future satellite communications will require cooperation and interoperability between GEO, MEO, LEO. IoT may be the ultimate example of SDN. Sensors and actuators connect to local computing capacity, and then to more centralized and powerful capacity that manages the entire network of sensors, actuators and edge computers. The only way to create the robust, continuous connectivity needed for IoT is with a technology infrastructure that offers a fluid and dynamic portfolio of internal and external services. The number of connected Internet of Things (IoT) devices worldwide will grow from nearly 27 billion in 2017 to 125 billion in 2030, according to IHS. Satellite will play an important role in providing global IoT connectivity, as only 10 percent of Earth is covered by terrestrial communications (cellular, WiFi) — so will terrestrial wireless, and terrestrial fixed networks will provide the backbone that connects it all — and so will the people who know how to integrate these technologies and make the network optimize itself for cost and performance from moment to moment. Globecomm won the Top IOT Mobility Satcom Innovation award from the Mobile Satellite Users Association for just this mix of technology, networks and management expertise. I can’t mention IoT without including Analytics and Artificial Intelligence (AI). As businesses look to show measurable return on their IoT investments, AI will help to make sense of the data generated from an ever-increasing number of devices and sensors. In manufacturing IoT and beyond — oil and gas operations, robotics, smart buildings, home automation, supply chains, and so on — companies are slowly taking steps to add AI to automation to achieve smarter autonomy. The sooner companies start cultivating intelligent data from a wide range of interconnected devices by using AI-based applications, the sooner they will reach greater levels of financial and operational proficiency and realize better returns on their IoT investments. The more services connected to the internet, the greater the threat to end-point operations, and from potentially degraded speed and service quality. Think of it as pollution. The world rushed to industrialize, and then it discovered that unchecked industry leads to unbreathable air, undrinkable water and ruined farmland. Globecomm is designing cybersecurity into every network and the configuration of every end-point device, and we help our customers develop the plans and management systems needed to adapt to the changing threat environment. In August, 2018, Speedcast International announced agreement to acquire Globecomm, with the deal expected to close by the end of 2018. Globecomm complements Speedcast’s global network of satellite and fiber connectivity, and the company brings our trusted technological expertise and diversification of markets that make the combination of the two companies tough to beat. More important than technology, however, are relationships old and new. Our missions converge in the importance that customers receive. Ultimately, when we know and understand the customers, it allows us to fully grasp their goals and expectations and provide the solutions that exceed those expectations. Earlier in my career, I was nervous for the industry. There was talk of fiber reaching every populated area on the planet and cellular technology filling in the rest. Surely the demise of satellite communications was at hand. Today I’m upbeat, as I see the industry evolving and expanding to meet new opportunities. With the ever-increasing demand for broadband connectivity, linked to the cost-performance benefits expected from the next generation, high-throughput GEO and non-GEO satellites, we can expect wider deployments of satellite as a communication medium. I’m looking forward to the new future of our industry as it continues to evolve and grow and, of course, deploy continuous innovation. I wish you all a blessed holiday season and all the best in 2019. Paul Scardino is the Senior Vice President, Sales Engineering and Marketing and is responsible for Globecomm’s technical solutions, products, sales operations and marketing. Previously, he was Vice President, Corporate Sales and Marketing as well as Senior Director EMEA Region responsible for the P/L within Europe, the Middle East and Africa as well as customer specific global accounts. The stars were definitely aligned for Goonhilly in 2018. We kicked off the year with an £8.4 million contract from the European Space Agency (ESA) to upgrade one of our antennas to become one of ESA’s deep space nodes in what will be the world’s first, commercial, deep-space communications station, capable of tracking missions to the Moon and Mars. This was quickly followed by a collaboration agreement between ESA, Goonhilly and Surrey Satellite Technology (SSTL) for Commercial Lunar Mission Support Services. Together we plan to develop a European lunar telecommunications and navigation infrastructure that will support lunar scientific and economic development. Uniquely, these missions will be funded by payload customers wanting to take a piggy-back ride to the Moon on the Lunar Pathfinder spacecraft. Payload commitments have already been secured from some customers for the first flight and the expectation is further commitments will be obtained to fulfill the payload quota during 2019. The Moon also lies at the heart of the company’s formal collaboration with SSTL and Astrobotic. Next year, Astrobotic plans to start delivering uncrewed payload flights for organizations carrying out operations in particularly challenging destinations on the Moon, including the far side. The three partners are working together to deploy sophisticated commercial lunar communication relay services that will support these endeavors and expand the commercial lunar economy. In May, the company welcomed UK businessman Peter Hargreaves, founder of the FTSE 100 financial services firm Hargreaves Lansdown, as an investor. Sharing our bold vision of becoming a new space disruptor and leader, Peter has given us the financial resources needed to embark on the firm’s ambitious plans to build a truly global business spanning commercial space communications, space exploration, data services and leading edge engineering design. Following this investment, with one eye on the future in 2018, our other eye has been focused firmly on the continued growth of our established and profitable spacecraft support and services business offering telemetry, tracking and control (TT&C), deep space communications and LEO tracking and monitoring services. Goonhilly is proud to have retrieved or renewed contracts with most of the world’s major satellite operators to provide the vital communications required to fly and guide their satellites. Achieving the goal of building a global business that will shape the next wave of satellite communications requires Goonhilly to quickly grow. Last year, we roughly doubled headcount and expect to do the same in 2019. A star appointment was the respected space and satellite industry veteran Bob Gough, who joined in July as Head of Business Development, Australia and Asia-Pacific to spearhead our growth in this important region of the world. As well as the new Australian office run by Bob, we opened a second office in the UK in October. The new Farnborough site complements our base in Cornwall and supports the company’s plans to expand the firm’s consultancy, design engineering and small-scale manufacturing capabilities. A particular highlight is the work on the development of Software-Defined Radio (SDR) and smart antenna systems for supporting ground terminals. With a renewed interest in the Moon as a destination for prospecting and exploration - and ultimately as a stepping stone to Mars – deep space is definitely back in favor. In 2019 we will see more commercial and government-backed missions being planned and executed as the deep space economy lifts off. The LEO satellite market in particular will be one to watch in 2019. Supporting a constellation of LEO satellites with a collection of tracking antennas on the ground is complex. In our view the sector has so far struggled to find the right satellite tracking business model that will open the floodgates for massive growth. 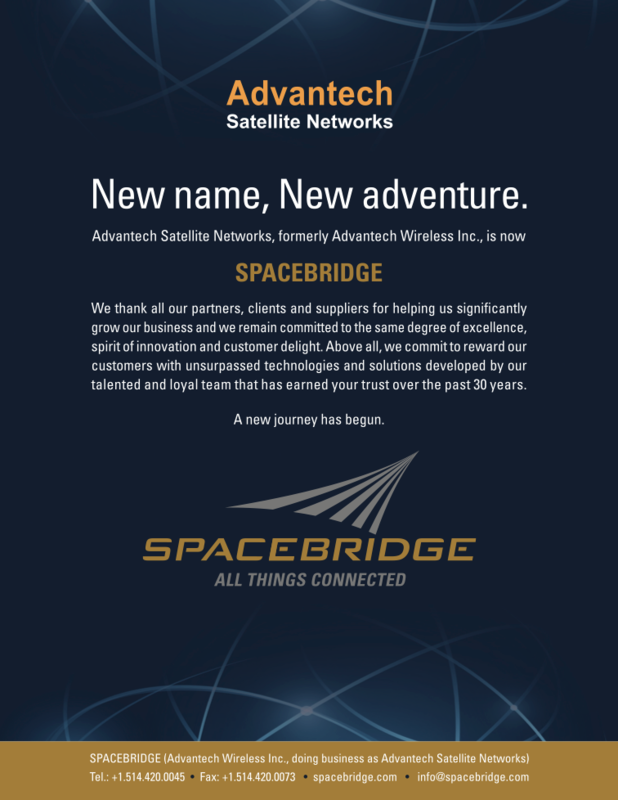 We’re already hosting tracking antennas for a few customers, and we are firming up partnerships in this space. We see a real gap in the market for a disruptor like Goonhilly to make waves here. To support the constellations of orbiting satellites starting to come into play, we are starting work on designing, and ultimately manufacturing, new kinds of advanced phased array systems for LEO satellite tracking. Plus a little further out we plan to design and manufacture user terminals to house and enable these arrays. For some reason, radio astronomy has never been considered a part of the space sector. But this is about to change. This year we’ll see a ramping up of interest in applying radio astronomy techniques to solve some of the new space communications challenges. Working closely with the UK’s academic radio astronomy community our engineers are already applying the latest radio astronomy techniques to innovative commercial projects, for example, the development of whole-sky antenna arrays for detecting and tracking satellites. These arrays will in turn enable other services including: IoT-centric satellite terminals; 5G satellite systems; aeronautical terminals; and highly efficient and high-throughput modulation designs for constellation communications. We are investing over £1m in upgrading the power, cooling, monitoring and fire-suppression facilities in our state-of-the-art data center. Goonhilly sits at a unique geographical location on the world stage where sub-sea fiber-optic cables from all continents converge at landing sites nearby. We plan to make our facilities freely available to carriers wishing to participate in our Internet Exchange and committing to minimum service level agreements. Last but not least, we are a key partner in the UK’s plans for spaceports We can expect updates from Spaceport Cornwall on their plans to provide Virgin Orbit with a strategic location at Newquay for the UK’s first horizontal rocket launches using a 747 plane. This exciting venture is one that is particularly close to my heart as it will see Goonhilly providing the all-important tracking services. Ian Jones is founder and CEO of Goonhilly Earth Station Ltd. A talented satellite communications engineer and successful entrepreneur with over 30 years’ experience, Ian has led the rejuvenation of the renowned Goonhilly satellite teleport, building a profitable business offering commercial satellite communications, deep space communication, radio astronomy, and data center services, training, and business co-location services. Prior to running Goonhilly, Ian was Managing Director of Orbit Research Ltd., a company he co-founded in 1994.